I have a wall of note cards with phrases written on them right above my desk. Some come from songs, some come from thoughts or conversations or books, or interviews; whatever. They’re not rules. They’re not things I aspire (and ultimately reduce myself) to. They’re not justifications for finding ways to accept events as if there were no other possible outcomes. They’re reminders, because one thing I’ve found is I tend to forget the important stuff and, even if I don’t, I need to reacquaint myself with it. Like Christina Perri, I’m only human. I’ve been thinking a lot lately. It’s the end of summer, and this is the first one I’ve had completely off since I was 17 – that’s no work, no side job, no commitment whatsoever. A lot of life has been lived since last August, and not exclusively in the Pitbull way. So there’s been a lot to think about, but what’s strange is in most cases the thoughts aren’t from this year. I tend to think thoughts are cumulative and build on each other, whether we want to acknowledge it or not. That would mean something that seemed irrelevant even as it happened years ago still ultimately counts for something. It’s how we form ourselves. 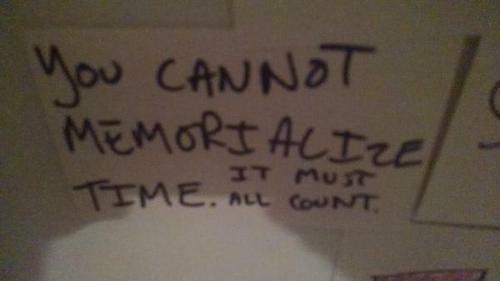 I also think that, like personal libraries, the principle use of memories is often misguided. They’re not necessarily there to be talked about, though it may very well happen. They’re resources with reminders written on their spines. But for me, it gets tricky when I remember details of a conversation I had when I was 16 (nearly ten years ago – dang), or how absent I was from moments in middle school despite physically being present. I don’t say these things in passing, either. They’re not moments I discard when they come into my head. I’m not waxing on fleeting funnies. They’re things I hang on to, things I linger with and sleep in. That’s probably why I tend to think anything from any given moment counts. But I can’t find even the smallest clue as to what my brain wants to remind me of from thirteen years ago, or twelve or nine or however many years ago. It drives me nuts. As much as I’m a completely different person, I’m the exact same. I’m the sum of my parts, and sometimes it keeps me up at night. Self-discord is a hell of a dance partner. Some nights I think the reminder, the resource, is knowing I’m not that person anymore. And that’s good, because staying the same is the quickest way to get stuck. But some nights I think why I need such a coarse reminder, and others I wonder how it hasn’t worn itself out yet. I wonder how long a memory can honestly serve a purpose, and how long we look too hard to see what it is. Maybe the reminder is to breathe (and if that’s the case, hat tip to Eddie Vedder). I think knowing we’re the sum of our parts is in our bones, and I think it’s bound to keep us up at night sometimes. I guess it’s just been my turn. Listen, Bub: Everyone is Wolverine.